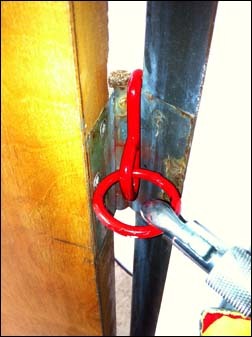 We made several trial uses of the Search and Rescue Hook in different settings. 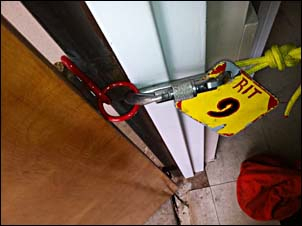 Using a lifeline is not a standard evolution during our searches, but it does have practicality in R.I.T. situations and special circumstances. 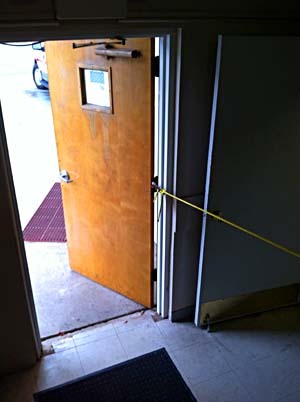 We tried using the hook in a variety of situations and it was successful on door hinges and the perforated metal wall studs. It held firmly and was reliable. It was also quickly attched and hooked into. In a commercial or other large area, there may be nothing to attach it to, however. All the guys trying it felt that it is easy and convenient to deploy, yet limited in where it can be used. 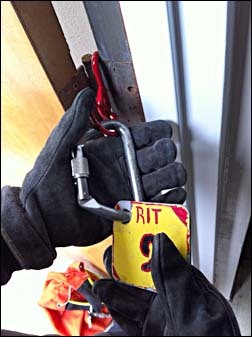 Overall, we liked using the hook when we could. 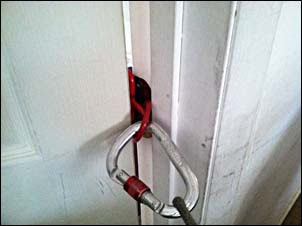 For more details or to purchase the TFS: Door Chock & Rescue Hook, click here.